Sometimes you just need a little side dish that makes a standard meat and three veg meal a tad more special. Years ago a friend gave me a packet of Israeli cous-cous and it was the recipe on the back of the packet that inspired this risoni (or orzo) dish. If you’re unfamiliar with risoni, the (Australian) way to understand this carbohydrate is ‘pasta in the shape of rice’ and it can be found in the pasta section of most supermarkets. 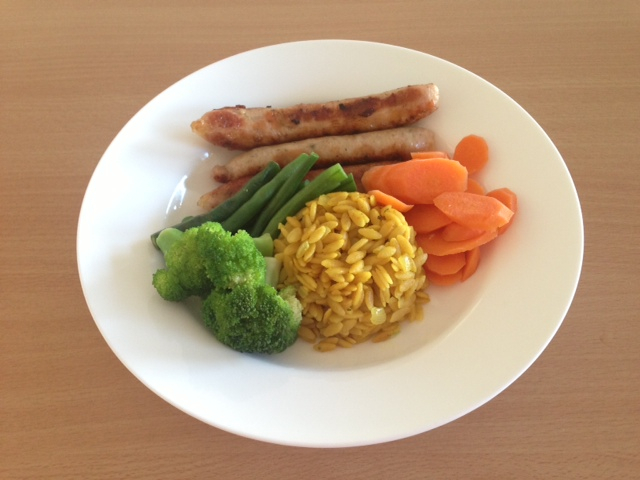 This not-at-all-spicy dish is really quite fast to make: you can get it going quickly and then reduce it to the absorption stage, which provides all the time you need to whack on whatever meat and vegetables you might be having, in this case, chicken sausages and steamed vegetables. And there’s no reason why this must be a side dish and not the main dish – just add some panfried pieces of chicken breast, a handful of freshly chopped parsley and some vegetables of your choice and you’ve got a dead-easy, one frypan main course – done. Using the ingredients and quantities below, this dish costs about $1.50 and serves 4 adult x 1 cup portions of risoni. handful of fresh parsley, chopped (though you can see from my picture I omitted it for the sake of my kids who aren’t so keen). Melt butter in a small frypan with a lid and add onion. Cook at a low temperature until onion is clear and soft. 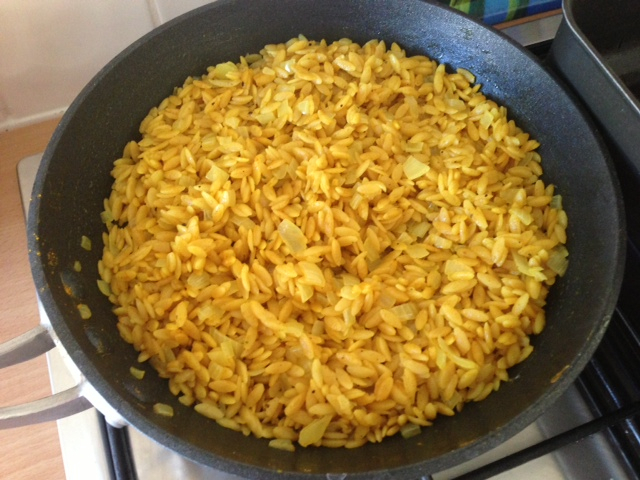 Add risoni and stir thoroughly to coat in the butter and onion mixture. Add chicken stock and stir carefully, adding in tumeric and cumin powder. Reduce the heat to the lowest possible setting, place lid on the pan, and allow everything to cook and absorb for at least 20 minutes. Just before serving, season with salt and pepper and toss parsley in too. Enjoy!